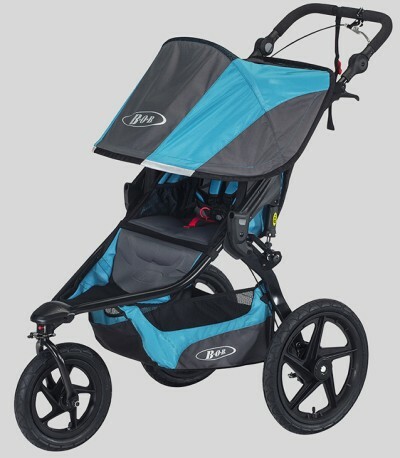 BOB Revolution PRO is one of the best jogging stroller I have ever used. Me and my husband were finally enjoying long walks and jogging without worrying about our children safety and stroller durability, which was the case with many other models we have tried. BOB Revolution PRO 2016 is perfect solution for active parents who want to jog or roller skate with their baby. The stroller can be used also for strolling to the park or forest and off-road cruises. This jogging stroller is not only for parents who plan on having intense workouts with their baby. It is also great for casual strolls over bumpy grass or sandy beaches. No matter what terrain you choose, with BOB Revolution PRO you can be sure your baby will have smooth ride and won’t get bumped around. 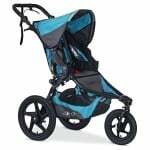 If you are looking for a reliable and safe jogger, check my full list of the best running strollers for 2019. 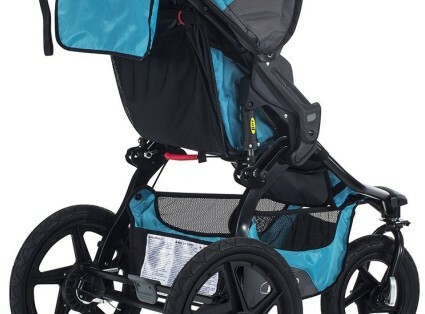 I would like to show you why this model is one of the best running strollers that you can find on the market today. I review the latest version of this stroller – BOB Revolution PRO 2016. BOB 2016 Revolution PRO has many great features which make it reliable, top-quality jogging stroller. Swivel front wheel, perfect suspension and three big wheels with air-filled tires, make the stroller easy to push through country roads, rough surfaces and tight corners. It breezes over bumps on the road, whether you walk, jog or run. BOB Revolution PRO 2016 is the right stroller for you if you plan on doing outdoor workouts and running up and down the hills a lot. It has a hand-operated brake, therefore you have great control over stroller speed and you can slow down quickly, if necessary. This model has also five-point harness, wrist strap and parking brake for your baby safety. There is nine-position adjustable handlebar, which is great for parents of different heights. 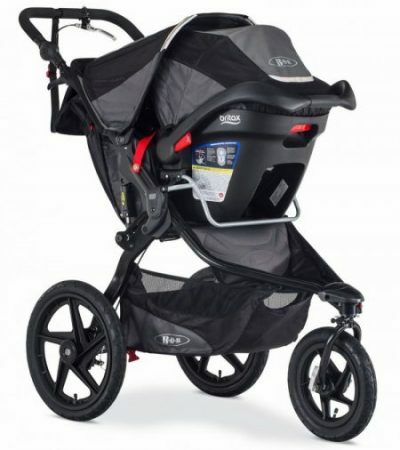 This jogging stroller has also large basket and few storage pockets to accommodate all of your essentials. Great thing about BOB 2016 Revolution PRO is that you can turn it into travel system, so you can use it from day one (during first few months only for walks). This stroller is compatible with many popular car seats, for example B-Safe 35 by Britax. BOB Revolution PRO 2016 has few small drawbacks. It is quite heavy and lacks automatic lock and standing fold. Despite this flaws, it is one of the best jogging strollers on the market right now. Keep in mind: You can start jogging with this stroller when your baby has good head and neck control and can sit up. The seat can accommodate a child up to 75 lbs. Thanks to 3-wheel design and air-filled tires BOB Revolution PRO 2016 is very stable and agile. The wheels roll on any type of terrain: grass, gravel, sand and mud. The majority of average strollers don’t handle that kind of terrain! Many other strollers we’ve tried bogged down and we had to carry it. Air-filled tires make all the difference in maneuverability and riding comfort. Front wheel is 12.5”, the rear wheels are 16”. They have upgraded function of quick-release. Big advantage of BOB Revolution PRO is the front swiveling wheel which can be locked. 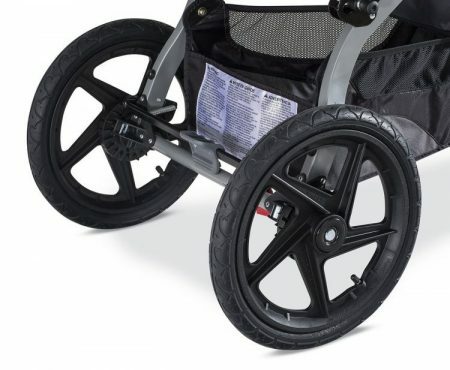 Pivoting front wheel gives stroller greater maneuverability and makes it easier to navigate in narrow spaces. It’s perfect option if you want to use this stroller in the city, for running errands of shopping. Thanks to swivel front wheel it will be easier to steer in crowd. Locked front wheel works great when you jog on tough terrain. I usually run on wooded trails or park paths and this stroller handles everything. Moreover, some time ago we lived in a country and there were many dirt roads, hills and grassy tracts which we often stroll and run over and my Haley didn’t ever complain (in fact, she often fell asleep during my jogging). This stroller handles inclement weather really well. Few times when I was jogging with my daughter in the park, it started to rain heavily. There were many puddles, even mud, and BOB Revolution Pro handled them perfectly and we got home safely. This stroller is very agile and easy to push even with one hand! We used it even on sandy beaches when we were running along the water of Pacific and it didn’t get stuck. Although This stroller has air-filled tires, it doesn’t come with an air pump. You can purchase it separately – you just need a normal bike pump. The suspension system can be adjusted, depending on your baby’s weight and terrain you want to stroll/run over. Two different shock adjustments make the ride ultra-smooth for children of different age and weight. Thanks to state-of-the-art suspension system, this stroller rolls like a breeze even over grass, gravel and cobblestone. It absorbs shocks so the baby doesn’t bounce in the seat. Suspension system is very important, not only during running but also strolling over uneven terrain, because babies have delicate spine. If the ride wasn’t cushioned sufficiently the baby would get bumped around and this could lead to spinal diseases or other back problems. With BOB’s amazing suspension you don’t have to worry about these issues. Your child is well protected from shocks impact. Hand activated brake is very useful if you often run up and down the hills. Thanks to it you can control the speed of the ride, like in a bicycle. With the handbrake I have never felt like the stroller was dragging me, I could always keep it at my own pace. The handbrake is placed conveniently and it’s easy to reach and use. Because of the rear drum brakes this model is 2 lbs heavier than BOB Revolution Flex model. The second brake is a foot-operated parking brake. You should engage it every time you take a break and stop strolling or running. What is important, this brake is placed properly – it doesn’t get in your way during jogging. 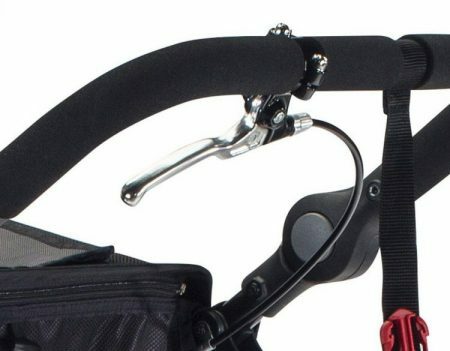 The strap should be put around your wrist to prevent the stroller from running away from you. It’s an extra security feature for you and your little one. The strap has also a lock which you need to use to lock the folded stroller (since there is no automatic lock). It is another feature very important for your baby safety. The harness is nicely padded and straps are really thick. Besides, you can adjust the straps so they could fit your growing baby properly. The harness ensures that your little passenger stays in a proper position the entire time. On the BOB’s official website it says that the seat is designed for 8-week-old baby, but remember that an infant doesn’t have enough head end neck control at this time and this seat doesn’t provide enough support for such a little baby. I would recommend using this model (and every other jogging stroller) from 6 months. If you want to use it earlier you can turn it into a travel system, but keep in mind that you can only stroll (not run) with a baby in an infant car seat. In PRO 2015 model recline system was two-hand, but BOB Revolution PRO 2016 has one-hand recline. To raise the back rest you will still need to use both hands. The seat reclines to 70 degrees from vertical which provides very comfortable place for naps during strolls. BOB Revolution PRO has such a comfy seat that my daughter prefers to sit in it, rather than in her umbrella stroller! In the latest version the seat has also more upright position which is great for older toddlers who like looking around and observing surroundings. The seat is very well padded and durable since it’s made of high-quality fabric and equipped with water repellent coating. The padding is also easy to clean. 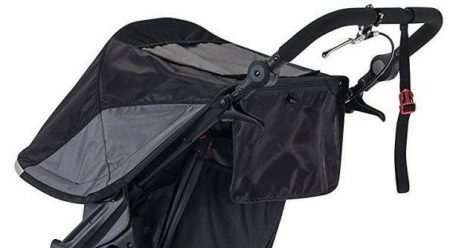 There is one thing that I don’t like about this stroller seat – between the calf rest and the seat bottom there is a part that is not padded but made of a bit rough fabric. It wasn’t a problem for my babies, but if your child has very sensitive skin, this fabric may rub it. Keep in mind that this jogger doesn’t have a bumper bar. You can get a tray for your baby and it can serve as bumper bar as well (check the price for BOB child tray). This model has adjustable handlebar with nine height settings – from 34” to 48” from the ground. It is great feature for parents of different heights. It is useful for us, since my husband is a foot taller than me and he always complained about our old stroller handlebar, because it was too low for him. With this model, we are able to adjust the handlebar height in a convenient positions for both of us. I am 5’2″ and I have rather short legs so I always rotate the handlebar down, but my husband (6’2″) sets it higher. This oversized canopy protects the baby from different weather conditions. This sunshade has many different positions and covers almost the entire seat. Nevertheless, to protect your baby from the rain you will still need a rain cover. The canopy is equipped with large peek-a-boo window so you can keep an eye on your little passenger the whole time. There is a large basket underneath the seat which can easily accommodate a large diaper bag. BOB Revolution PRO 2016 has also two mesh pockets inside the seat for baby’s sippy cup, snacks or toys and one big mesh pouch on the back of the seat for your essentials (wallet, keys, phone and a bottle of water). BOB Revolution PRO 2016 basket is also 15% larger and placed a little bit lower than in the 2015 model. You can easily and quickly snap the infant car seat into the stroller. Thanks to this option you are able to use this stroller from birth, but only for walking (it’s not safe to run with a baby in infant car seat). However, you will need a proper adapter (sold separately) to attach the car seat. BOB Revolution PRO is compatible with many popular car seat brands: Britax, Chicco, Graco and Peg Perego. You can check Chicco adapters here. You can also find there other models. BOB Revolution PRO 2016 can be folded in two-step process. 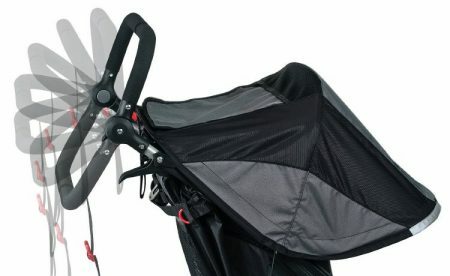 Although the producent says it is one-hand folding, you will rather need two hands to close this running stroller. But it is still fairly easy to do. 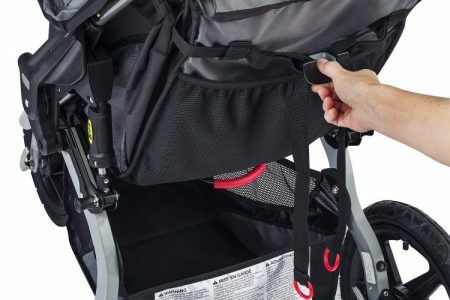 After you fold the stroller you need to put it on the ground and to lock it with the clip that is attached to the wrist strap, since there is no automatic lock. It can be quite difficult and fatiguing, especially for someone with a back pain or moms after C-section. This running stroller is quite heavy, it weighs 30.5 lbs (2.3 more than 2015 version, because of the rear drum brakes). You will be lifting it to the trunk or carrying it up and down the stairs, so you cannot ignore its big size and weight. Fortunately, the rear wheels can be removed to make it more compact which is very useful for parents who have small house or small car. Thanks to so many useful features, this stroller provides comfortable and smooth ride, even on rough terrain, but it may be too heavy and bulky to serve you as a primary stroller. For everyday use I would recommend something more portable and lighter, especially if you’d like to take your stroller to the mall and shops frequently. BOB Revolution PRO 2016 is available in four colors: Black, Canyon (orange), Lagoon (blue) and Meadow (green). In my opinion the Lagoon version looks awesome! Depending on the color, the availability and price of this stroller may vary a bit. You can check the currently available colors and compare their prices on Amazon – official seller recommended by BOB. Here is a video that presents BOB 2016 Revolution PRO features. This stroller is quite expensive, however it doesn’t come with any accessories. Parent tray and cup holder are not included, so there is no place to keep a bottle. Bending down during jogging and reaching for a bottle of water to the mesh pocket on the seat back is really annoying and in my opinion not very safety for the little passenger. I think the cup holder is an essential equipment for a jogger! Unfortunately you need to purchase it separately. I found it a bit annoying that I had to pay extra for it. In the table below you can check few other accessories that are available for BOB Revolution PRO Single. 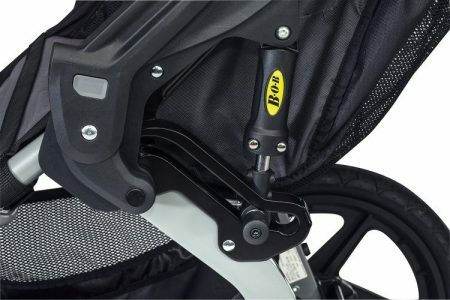 BOB 2016 Single Infant Car Seat Adapter for Britax & BOB – if you want to use any BOB jogger for an infant under 6 months, you will need a specially designed adapter that allows to snap an infant car seat into the stroller frame. For each brand there is separate adapter, here is the one for Britax and BOB car seats. BOB Single Snack Tray – we can put on this tray some snacks and drink for our little passenger. Snack tray can also serve as a bumper bar. This product has very reasonable price. Bob Stroller Handlebar Console with Tire Pump – since BOB joggers don’t come with a cup holder, we have to buy it separately. Cup holder is essential for runners and BOB offers great handlebar console with a place for two bottles. It comes with a tire pump, very useful for BOB’s air-filled tires. Here you can see some photos of this console. BOB Weather Shield for Single Revolution – this cover will protect you little passenger from different weather conditions. You can read some reviews on this shield here. The frame has a 5 year limited warranty and other components and fabric have 1 year warranty. Remember to keep the proof of purchase. I checked this jogging stroller on Amazon, as this is the seller recommended by the manufacturer on the BOB official website which means you get there the original product with warranty. BOB Revolution PRO has really high customer rating and lots of positive reviews (check the current number of reviews). Many parents recommend it as a high-quality product for serious runners and those who live in rural area. 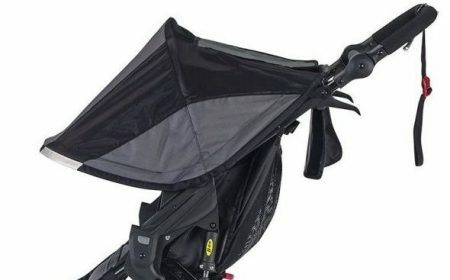 Customers praise its large canopy that gives excellent coverage for the baby. This stroller has awesome harness that is very easy to adjust. 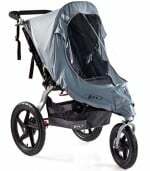 It handles dirt trails and rough terrain so smoothly, that the baby can sleep soundly while you are running or hiking. Another advantage is ability to push it with one hand even when going over unbeaten paths. Parents also recommend BOB as it has wonderful customer service. One disadvantage is the fact that you have to buy all accessories separately which can be a bit pricey.Some parents complain that folding requires using two hands and the closed stroller is still a bit clunky. Lifting it requires some strength and fitting it in the trunk may be a bit difficult if you have a small car. However according to many parents the added weight is worth the added quality, sturdiness and stability. BOB Revolution PRO is very agile, maneuverable, easy to steer and made of durable materials. This stroller hits all of the key points. 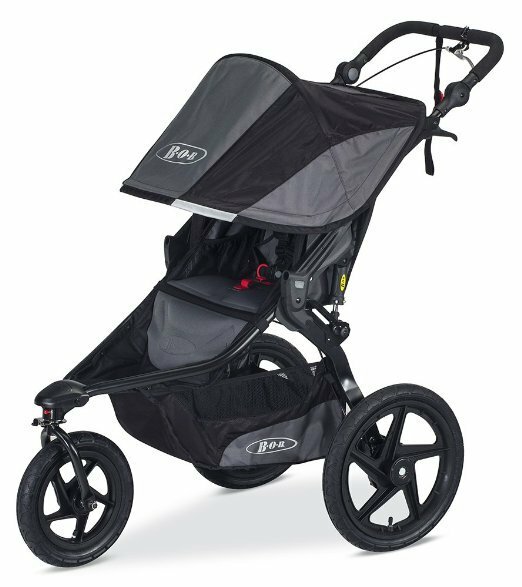 If you want to run or stroll with your baby a lot and have the ability to go over any type of terrain, BOB Revolution PRO 2016 will not let you down. It is a perfect combination of high-quality and comfort. This stroller is quite heavy and bulky, but as a jogger it serves its purpose very well. It is strong and robust enough to handle the toughest terrain, but the weight may be annoying during daily use. 1. With this stroller you can keep up your healthy lifestyle, get back into shape after pregnancy or just spend time with your baby and be active at the same time! It is great option for serious runners as well as for parents who run or hike occasionally. 2. If you live near wooded trails or like to stroll over gravel and grass, this stroller is definitely for you. Thanks to amazing suspension and large pneumatic tires your baby will be well protected from bumps and shocks impact. 3. This big stroller is very easy to steer with one hand and thanks to additional handbrake you have better control over its speed. Are you thinking about buying this stroller? Make sure to check available discounts on Amazon – seller recommended on BOB’s website. Do you know the seat to canopy measurements for the Revolution Pro 2018 or 2019? We have the Revolution Pro 2015 and my tall 2 yo outgrew the seat (bum to top of the head 22 in). We just purchased the Bumbleride Indie 2018 and though our son fits, the quality and ride does not compare to our BOB. Before we try to return the Bumbleride we were hoping to find the seat to canopy measurements on the Revolution Pro 2018 or 2019. No one local carries it in the store. Thank you! Hi Heather! I think the latest version of PRO is 2016, BOB only upgraded FLEX for 2019 🙂 The backrest itself is not very long – it’s about 18 inches and from the bottom of the seat to the top of the canopy there are about 24 inches (so when the canopy is folded child’s head is resting on it). BOB recommends PRO stroller for a child up to 44 inches tall. Indie is definitely different than BOB, because it’s rather an everyday all-terrain stroller, suitable for occasional, light jogging or fast walking. I don’t think it’s a good choice if you like running at higher speed or on really harsh terrain (the wheels are smaller, the suspension isn’t as impressive as on BOB joggers so the bumps are more noticeable). I just got a used bob for a great deal but I’m worried about the recline not being able to be in a more upright position for my toddler as the newer version. Do you notice a significant difference? Or should I just be happy that I got a great deal on a double bob and make it work? Hi Kelsey! BOB PRO Duallie currently costs about $650-$700. If you got it much cheaper and in good condition, I would keep it 🙂 The difference is noticeable but if your toddler is not complaining, I don’t think you should pay extra just for this one feature.